Having a great camera makes the difference when you want to preserve a cherished moment forever. It is important that you do not leave your memories in the care of any old camera. No. You want the best. From the moment that you exchange wedding vows to your baby's first step, you need clear color and beauty. This is the kind of results that comes with using a capable camera, such as the Panasonic Fz1000. There are so many camera models on the market. It can get very confusing about which model to purchase. And even more perplexing, when it comes to understanding and properly utilizing the features or knowing which will give you the results you need. This is why it is important to continue reading and learning about the Fz1000. It has good features, solid casing and gives you very respectable quality images. 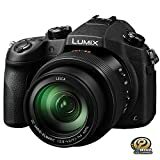 The Panasonic Lumix Fz1000 4k Point and Shoot Camera, 16X LEICA DC Vario-ELMARIT F2.8-4.0 Lens, 21.1 Megapixels, 1 Inch High Sensitivity Sensor, DMC-FZ1000 gives first rate picture quality. This camera model has a 4K video recording feature. A big 1–inch sensor generates the outstanding pictures. And this works in conjunction with the all–new lens, which completely conveys the boundless depth and sunlit warmth of nature. Your images will appear so much closer with the 16x optical zoom. You will be able to see clearly everything from baby birds, squawking in their nests, high up in the trees - to wildlife grazing on the horizon. With the crisp 4K resolution, you will not be disappointed with gorgeous videos and images. The Panasonic Lumix Fz1000 4k Point and Shoot Camera is a great choice for anyone who wants to catch even the minutest detail in nature. This camera model from Panasonic has a great zoom feature. It comes with a wide-angle 16x zoom lens comparable with a focal range of 25-400mm. The Panasonic Lumix DMC-FZ1000 is sold for approximately $400-$600. You can view available items on Amazon. Panasonic, which is a manufacturer of first-rate electronic products, has assertively introduced the new to market Lumix DMC-FZ1000. It has been touted as a “game changer” for digital cameras. This is the leading brand to give us a compact camera that comes with a 4K video capture. So one can only imagine how excited photographers and amateur video makers are for such an affordable gift. Now they can all retrieve a still image from a 4K sequence. And at the end of the day, it will look just as great as if it was a still image taken with an 8 megapixel camera. We are also grateful for the stop motion animation and time-lapse effects that are available with this the Panasonic Fz1000. It is a great video option and one of the elements that makes this camera top-notch and a ‘hybrid’ merchandise. But it is not only those elements that cause us to brag about this intriguing camera model. The Fz1000 also has a one inch 20.1 megapixel ‘Mos’ sensor along with a Leica branded lens. You will find similar features in the Sony’s RX10 bridge camera model or the Nikon’s ‘1’ camera system, with relatively a similar chip size. The second feature, the Leica branded lens, gives a focal length the same as an especially wide angle 24-100mm in 35mm terms. This ultimately converts to a 16x optical zoom. Therefore, this big lens ‘all in one’ will be a crowd favorite among amateur paparazzi, outdoor photographers and even bird watchers. They will love the extensive variety of framing options. There is no lagging with the start up time, because of the newly included Venus engine processor. It gives a speedy AF reaction at the telephoto end of the zoom. In addition, there is also a high-speed OLED display. Comparably, at this level, you will not find anything like it on the market. This camera model clearly looks like your characteristic super zoom or bridge camera model in every way. And this amps up the resemblance to an advanced DSLR that instantaneously inspire confidence at the same time as making the user expectant of all the great visual images to come. It has a prominent on-board features consist with a outstanding electronic viewfinder, 3-inch ‘free angle’ LCD screen, tilting screen, as well as a 2,359K dot OLED EVF and 921K dot. On close examination, we note that the camera is a bit on the chunky side, which adds to the overall size of the product. But that might cause some buyers to be pleased with spending the asking price for the Panasonic Fz1000. When compared to a DSLR kit, it is still only coming out at about one third of the weight, which means it is still easier to carry around. A comfortably molded handgrip facilitates the act of holding the camera steady while taking shots at maximum zoom. You can use just three fingers and the forefinger can stay close keenly above the shutter release button. Regardless, we find that you get a good grasp from the handgrip and can support its weight sufficiently. We are full on into the 21st century, so many buyers expect Wi-Fi connectivity in their products and the Panasonic Fz1000 does not disappointment. It comes with both NFC and QR code interaction in conjunction with the ability to support remote shooting via a free downloadable ‘app’ from Panasonic. The application also allows for you to create photo collages. We were happy to discover that it also has the capability to allow shared viewing on a television set. It is with fascination, that we found that the Panasonic Lumix Fz1000 4k Point and Shoot Camera has a 3:2 default still image ratio. That typically allows for you to have the complete 20.1 efficient megapixel image. Your resolution size will decrease to 17.5 megapixels, if you prefer to adjust the image ratio to 4:3 ratio. This is what is typical in many ordinary digital cameras. As you would expect, we saw that the Panasonic Fz1000 does have the capacity to capture both a raw file format. But it can also do both a combination of JPEGs along with the raw files. Having it write the image in a JPEG format does not affect the speed of the camera processing much, so you could use this as a default setting if you wish. This feature is of great benefit when it comes to arranging your shots. All you have to do is leave automatic default on. And then the eye-level electronic viewfinder will give you the palpable advantage that comes with having a built-in eye sensor. Because it is below the viewfinder and it adjusts without human intervention, you can count on it to turn on or off the larger LCD when it picks up on the closeness of an eyeball. Eventually, you will also realize that this key attention to detail benefits the you in the long term. It is a great advantage of having this camera model, because it counts towards the camera’s intuitiveness. At the bottom, to the right there is a four-way directional control pad. It is where the ISO settings are also located. The Panasonic Fz1000 has an ‘intelligent’ and auto ISO options. These have manually selectable increments from ISO125 to ISO12800, which are also staggered. You can also access the macro mode implementation as well as the white balance using the same dial. So we have completed looking at the features of the camera. Next, we further analyzed the image quality of the Panasonic Lumix Fz1000 4k Point and Shoot Camera. The average image size when using this camera model is 9Mb. This is what you get when you adjust the Fine JPEG setting to about 20 megapixel. With the FZ1000, you can rest assured that your pictures will come out looking clear and bright. But sometimes the pictures that were taken at the telephoto end of the zoom did not have razor sharpness. Regardless, the images could still be considered absolutely satisfactory. Whether it was on a stand or when it was handheld, this model of camera from Panasonic held its own. Mind you, it cannot be counted as having the longest lens reach. Nonetheless, the fact that it has the resolution, sensor and lens that it does makes it all work together without compromising the quality of the images. We identified that it kept its detail, even as far as the frame corners, at maximum wide-angle. All this was devoid of any perceptible fish eye effect and this was a great advantage. Though, it is important to note that when we used it with the lens hood and at the widest lens setting, there was a ‘vignetting’ effect. It was disappointing to see that the edge of the lens hood was continuously in the shot. However pleasantly, it was good to see a higher level of function with the top sensitivity settings of the ISO. This was still the same when the lens hood was taken off. Mind you, the details of the image get a little blurry at around ISO6400, but it does a good job of minimizing the noise. Nonetheless, it is a decent image, which certainly is generated because of the bright, fast lens and a good-sized sensor that does not impose with pixels. An added benefit of the Panasonic Fz1000 is the pretty decent still image that you can retrieve from any length of the 4K video feed. One would think that someone who captures fast moving animals or other objects could greatly benefit from this and not worry about a blurry image quality. So, yes, if you are looking for a great camera, the Panasonic Lumix Fz1000 4k Point and Shoot Camera , 16X LEICA DC Vario-ELMARIT F2.8-4.0 Lens, 21.1 Megapixels, 1 Inch High Sensitivity Sensor, DMC-FZ1000 is a great camera to own. It is a top bridge camera, which you can get at a good price. Nevertheless, for anybody who wants 4K-video shooting devoid of having to change lenses, it is to this point an exceptional product for its bridge camera category. You can consider it a little bulky and not necessarily the most compact camera on the market. But if you can use all the above-mentioned features and you require great quality images, it is a best choice. Overall, we rate it a 4.25/5. The Panasonic Fz1000 is a top bridge camera, which you can get at a good price. The Fz1000 comes with a 4K video capture and Venus engine processor that gives a speedy AF reaction at the telephoto end of the zoom. Previous articleReview of the Pentax K-S2: Is it Worth Your Money?